I spent more hours than I care to admit researching what luggage to bring, and finally decided on two 65L wheeling backpacks (from Osprey) and a daypack for each of us (also from Osprey for no other reason that I’d run out of energy to look into other brands). We debated the backpack-versus-wheeling-bag question for a while, and went for the middle ground, and after one month of traveling, have not used the backpack straps once, although if we ever need to climb a bunch of stairs we will be happy to have them. In my ideal world, everyone, including my five year old son and my eight year old daughter, would pack and carry their own belongings, each wheeling their own bag and carrying their own daypack, containing their clothes, toys, material for school, devices for entrainment, and so on. The logic being that losing something precious to you will help you keep better track of your things. But in reality, losing their sweatshirt or school notebooks, or worst of all, the mini-Ipad, makes the lives of my husband and me harder not theirs. Besides, keeping track of two suitcases and four daypacks in airports and bus stations is difficult enough. Already when leaving the airport in Addis Ababa, the capital city of Ethiopia where our adventure began, we lost track of one of our daypacks. It turned out it got stuck in the X-ray machine required as you exit the airport, but there was a moment of panic when we left the kids guarding our bags as we charged back to where we’d been waiting in line to see if we left it there. So the less bags the better. Traveling with only two rolling bags also means that during the middle of the nights arrivals or departures–when the kids can barely walk, never mind wheel their own bags–each parent has a hand free to hold on to one of theirs, or can even throw them over a shoulder in a pinch. So with six bags between the four of us, how do you keep track of what goes where? By default , I am the designated finder of everybody’s stuff and the only thing I hate more than being asked if I know where a clean pair of my son’s socks, the cord for the mini-Ipad, or the Advil might be, is having to pull apart the luggage to find it. I noticed travelers on forums raving about the necessity of travel organizing sacks and cases. Really? I thought. After dropping all that dough on the luggage, I need to now buy little cases and packs to go inside? But after three weeks of travel to nine different lodges/hotels, I’m sold. 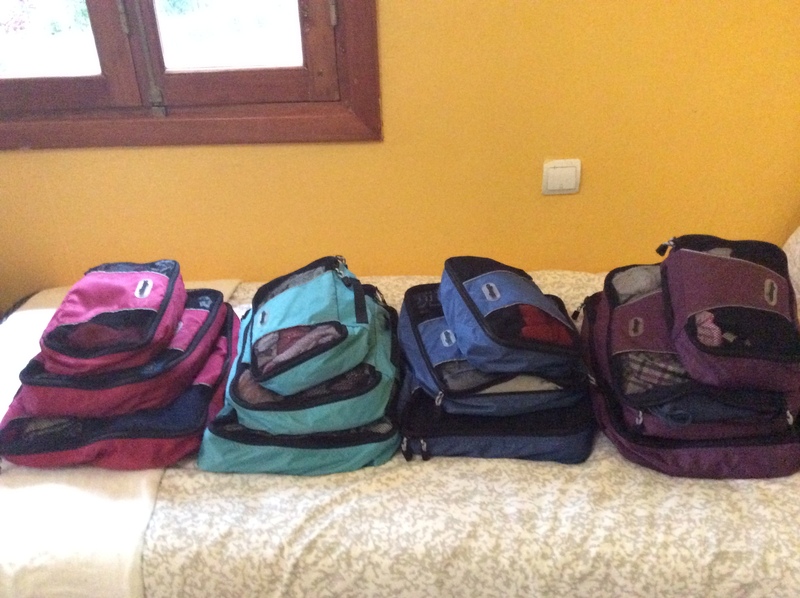 We got the Ebags packing cubes–with each of us getting his or her own color. We put bottoms in the biggest one, tops in the medium size one, and then underthings in the smallest. I also got a hard case for all our many cords and chargers and another one for the smaller devices and different colored sacs for toiletries and the first aid kit. Everyone, including the kids, now knows where each of their items belongs, so my hope is to spend less time looking for stuff and more time looking at all the amazing stuff around us. Thank you for the wonderful picture in today’s Wall Street Journal of our eBags Packing Cubes! We are honored to be part of your “precision packing” solution. If your travels will bring you through Denver, we would like to invite you to visit our company’s headquarters. Please let us know what might be convenient for you. Thanks Dana! We are planning to drive across country when we get back and might very well go through Denver, but first we have to find someone who needs a car driven from the West to East coast, for relocation or living bicoastal, or a break from a car rental company one drop off charge, in case you know anyone! Wish you guys had a partnership with Hertz. LOL.